Item #GS-2225: Approx. 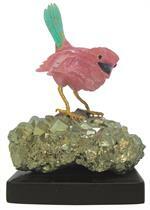 3"x2"x3.5" carved Rhodochrosite & Chrysocolla bird on Pyrite on approx. .5" black Basalt base. Item #GS-2226: Approx. 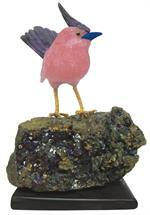 1"x3.25"x2.75" carved Rhodochrosite bird on Pyrite on approx. .25" black Basalt base.